1) Trace the sleeve foundation; then draft sleeve 6” long at underarm seam. 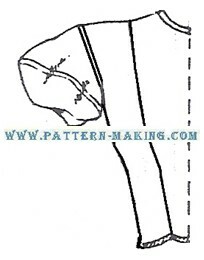 Divide sleeve in 2 parts, making upper sleeve 1” long at underarm seam. Draft lower sleeve 1/2 narrower each side of the underarm seam at lower . . .